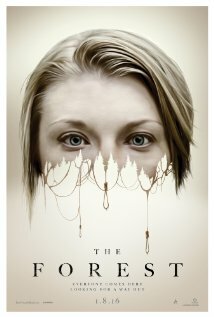 Twin sisters become disconnected when one becomes suicidal and submits herself to “The Forest”. The story is set in the Aokigahara Forest, a forest at the northwest base of Mount Fuji in Japan where people go to commit suicide. The destination’s horrific history makes it a place of abandonment for the mentally healthy, but a place of wonder for the suicidal who seek release among the forest’s many tortured spirits. Sara Price (Natalie Dormer), a young American woman, arrives at the forest in search of her twin sister Jess, who mysteriously disappeared. Sara knows something bigger is going on here than just a hike through the woods, as the two women share a twin mentality link that communicates to one when the other is in great trouble. Despite warnings not to “stray from the path, most notably from a mysterious American journalist she meets along the way named Aiden (Taylor Kinney), Sara enters the forest to discover the truth about her sister’s fate, only to be confronted by the angry and tormented souls of the dead who now prey on unsuspecting victims. Sara must find her sister and leave this place of terror before it’s too late for either one of them. If structured plots ever meant anything in the world of important filmmaking, “The Forest” would be the education lesson to all of the future directors everywhere on what NOT to do. There was so much of the film’s screenplay that didn’t make sense, and as a result the movie creates many situational flaws that stretch out the meaning of logic and do more damage to the few re-occuring characters that the film has. There are many times in the movie when Sara and Aiden switch moral ground, and the two go through multiple character changes that left me in total confusion. Over the course of ten minutes during the film’s second act (If you can call it that), Sara trusts Aiden, then doesn’t, then runs into great trouble where her only way out is for this guy to help her once again, but then he’s back to being a red flag when she gets out. This kind of character development pails in comparison however to the very laughable idea of Jess’s suicidal tendencies. The film informs us that the two girls lost their parents to a horrific accident in their home when they were children, but Jess was the only one who actually saw what happened, and because of that she is suicidal. I know there are different mentalities for every person, but why can’t Sara be suicidal just for the fact that the two most important people to her are now dead. Even if I go with that kind of logic, why hasn’t Jess tried to kill herself before. Did she always have a plan twenty years down the line to move to Japan and end her life there? That seems like a long time to hold on to such ideas. These are the kinds of situational problems with the script that took me out of an already far fetched set-up. If one thing works, it’s in the eerie setting of the forest itself. I was surprised to find that the Aokigahara Forest is a real place, and thankfully the movie doesn’t try to showcase anything out of the ordinary for it’s looks and feels of this dark place. Everything feels about as natural as it can be considering ghosts and evil spirits are behind every tree. I do personally wish the film could’ve given a brief history lesson on where everything started. During one scene in the opening fifteen minutes, Sara searches the internet looking for facts on the forest, but then closes it up when she sees a picture of one of the many hang victims. I feel like this could’ve been a good opportunity to educate the audience on the origin of such a cursed place. Did people just wake up and decide this place was as good as any to kill themselves? Or is there something much sinister at work here? This thought process could’ve added much more to the kind of uphill battle that Sara was facing for the rescue of the person she loves most in this world. The performances (sadly) are nothing special. Dormer has done quite well most recently in “The Hunger Games” franchise. Portraying one of my least favorite characters in the books, but making her character one of my favorite in the films. She is presented in that franchise in small doses, so we always feel the yearning for more. In “The Forest” Dormer doesn’t have the best of material, but I can’t really say it was all the script that resulted in my lack of intrigue to her character. From her emotionally streaky dialogue reads during heavily dramatic scenes, to her dry wit sense of personality, this character bored me to the point of really not caring about her fate. If it got the movie over faster, I could’ve lived with Sara failing on day one of her attempt at the forest. It’s a real shame too because Dormer has proven that she is better than this. I think it results in two problems. 1 – She isn’t as emotionally gifted as some of the other horror heroines who take on such a weak film, and 2 – This is her first starring role, so it might be asking a lot to fall in love with such a character for a majority of the movie. There is only one scene where Dormer isn’t on-screen, so you can imagine how many scenes felt like pulling teeth to her lack of interest in anything. “The Forest” is a rough start to the year for the most criticized genre of film in all of my reviews. If 2016 horror is to acheive the kinds of feat that three horror films did last year, they will have to use this movie as a trial and error for better terror recipes. It’s an agonizing 90 minute PG-13 snoozefest that doesn’t have enough character or story development to ever pull itself out of the January dumping ground that the higher ups already deemed it as. For better or worse, the only thing the film made me reason with were the poor souls in Aokigahara because after seeing this film, I feel desired to join them. If you remember, they did give a backstory in the beginning. When Sarah visited the school they explained they used to take blind and old people they couldn’t afford to feed there to die. Those spirits became angry and called out to anyone who was feeling sad. They would then feed on the sadness to make them kill themselves, like when Sarah thought she had maggots in the cut in her arm and almost cut her arm off to die. I do feel like you can tell when parts were pg13 and didn’t love that. I am very torn about the ending though. I don’t know if it was right. I wasn’t talking about a backstory on the people who died there, I was talking about the origins of the forest itself. When was the first person who died there? What effect has it had on locals visiting? Questions like that. I think they are important because despite the movie being called “THE FOREST”, you really don’t learn a lot about this terrifying place. Sure you see imagery, but you don’t know anything about these people. I don’t know if you saw 1408, but that’s a perfect example. They gave a brief rundown of the hotel and it’s victims, so you knew what ghost you were seeing on screen and how their story related to that particular scene. I hope you enjoyed the movie. Just wasn’t for me. So much doesn’t make sense about this movie. You raise so many excellent points.